Every year the Comic Con hits town, I head down to the Exhibition floor to check out the vendors. Yes there are the mega-sized corporate booths like Lucasfilm and Marvel, but unless you sprint to them directly after the doors open, they’re mobbed. (In fact, I’m often amazed at how there are already lengthy lines when I arrive directly after opening hour.) I prefer to frequent some lesser known vendors. My first stop is the Urban Vinyl Toys area. This is always located in the upper left corner of the massive floor (find the map PDF here). If you’re not familiar with Urban Vinyl, it means toys that you’re not meant to play with. I know what you’re thinking. Huh? Why shouldn’t I play with them. This is an offshoot of the action-figure-in-original-package set. Only here, these toys are designed to be looked at, not played with. Take Funko (booth 4829). Last year I bought a Thing bobble head. 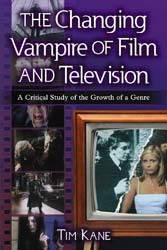 Sure I wiggle it once in a while, but most of the time it sits on my desk looking nifty and admired by my students. Yes I disagree that all Urban Vinyl toys need to be no touch items. 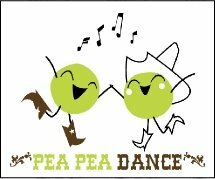 My absolute favorite is Conduct Happiness (booth 4832), creator of such slogans as “The Pea Pea Dance,” and “Pea in the Pool.” My daughter loves their Go Pea Go book. If I could, I’d buy everything at their booth. One of their neighbors is also a fav or mine: Mr. Toast (booth 4831). They make plush toys of unusual items, like toast and bacon. Basically, you can have your own plushy breakfast. (A bit like those ads at drive ins with the dancing hamburger and soda cup). Ok, I’m a sucker for anything old gods. Mostly I like the aesthetic, the tentacles and creepy vibe. For a general smorgasbord of items look no further than Adventure Retail (booth 4423, catty-corner to Urban Vinyl). They have plenty of stuffed old gods (we have a Nyarlathotep) and they even carry Cthulhu slippers (have these too). I’ve also picked up some Lovecraft audio books produced by Audio Realms. All the way on the other side of the exhibition hall (quite a trek), you’ll find Badali Jewelry (booth 530 right next to the ZDN Zombie Defense Network). They have the most amazing Cthulhu jewelry. 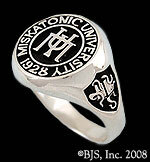 I own the Miskatonic class ring. This year they will reveal a new Necronomicon necklace. Okay, last year I found an aisle that had three or four great steampunk vendors (I want to say there were on the fringes—far right or left of the floor), but seeing as the Comic Con hasn’t designated any stempunk section, I’ll have to hunt for it again. One vendor that is easy to find is Weta’s Dr. Grordbort (Booth 2615 sharing with Dark Horse). 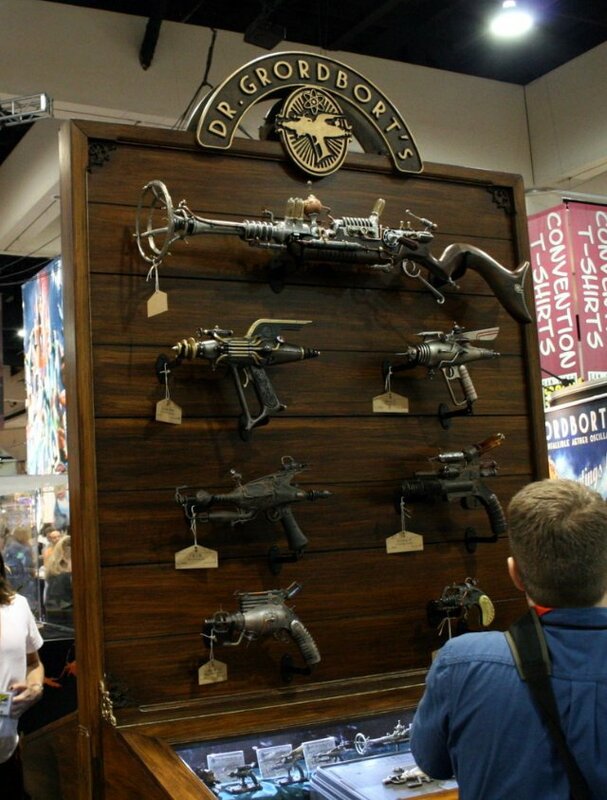 If you’ve never experienced Dr. Grordbort’s awesome ray guns, then you are not a true steampunker. These guns make you want to shed the internet for some steam and brass. So far I’ve picked up the tiny models of each gun (I still can’t afford the full sized ones). That’s pretty much it. I wander around, looking for eye catchers. If I can afford it, I’ll try to extend my Fantastic Four collection. But seeing as one issue in this range starts at a Ben Franklin, I often can’t afford these pleasures. Enjoy the Comic Con and remember, pace yourself. That’s a big convention center. This entry was posted in Steampunk, Weirdness and tagged Comic Con, Cthulhu, Lucas, Marvel, Necronomicon, Steampunk, Urban Vinyl, Weta. Have heard alot about this lately and now I am anxious to see one of these. I make custom made costumes and have made several for this event.